In an effort to understand the diets of plant-loving fish, FIU Ph.D. student Jessica Sanchez and marine sciences professor Joel Trexler delved into the world of herbivory in freshwater ecosystems. They wanted to develop a research framework for other scientists to follow in studies on the evolution of these diets. Their efforts resulted in a scientific paper that was published in a recent issue of Ecosphere. It was the 800th scientific paper published by research faculty in FIU’s Southeast Environmental Research Center (SERC). Joel Trexler, above, and his research team have published the 800th scientific paper from researchers in the FIU Southeast Environmental Reseach Center. “Many of our publications have not only had important scientific impacts, but they have also shaped current management practices and policy,” said Todd Crowl, director of the Institute of Water and Environment, which houses SERC. The publication milestone was just another day for SERC researchers who have informed scientific policy and management for more than 20 years. 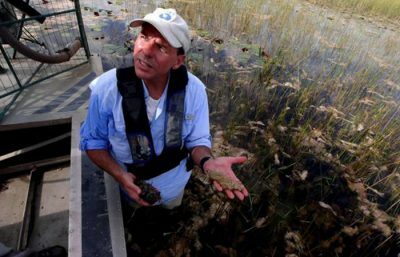 Research results have helped set the water quality standards for Everglades restoration that are still followed today. Center researchers also have provided scientific evidence that informed current coral reef and sea grass conservation and restoration plans. In addition, many of the sport fisheries conservation efforts in South Florida are based on research results generated by SERC scientists. “With its history of impacting environmental decisions by conducting interdisciplinary science in a collaborative, multi-institutional framework — and its vision for addressing the biggest challenges facing South Florida’s future — SERC reconstructs the way science is conducted to solve problems both locally and around the globe,” said Evelyn Gaiser, executive director of the School of Environment, Arts and Society and lead principal investigator of the Florida Coastal Everglades Long-Term Ecological Research Program, a key component of SERC’s work in the Florida Everglades. SERC was established at FIU in response to a growing regional need for scientific investigations in threatened environments of South Florida. The center’s research programs have been instrumental in the management decisions for fragile resources including Everglades National Park, Biscayne National Park, Big Cypress National Preserve, Florida Bay, the Florida Keys and the Florida Keys National Marine Sanctuary.